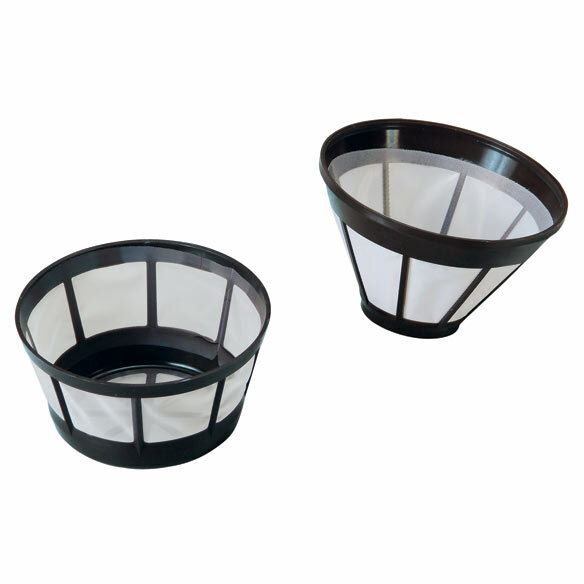 Reusable coffee filter saves money...No fumbling for filters! Basket coffee filter and cone coffee filter eliminate woody paper taste, and the hassle of trying to grab a single filter. Micro-fine polyester keeps sediment inside, so only pure coffee flavor flows through! Cleans thoroughly from top to bottom in the dishwasher. Cone: 3 7/8" dia. x 3 1/8" H. Basket: 4 1/2" dia. x 2 1/2" H.
I love this product, would by it again. Saves me money, will help me not throw money in the trash with using paper filters as I was using before I brought this beautiful coffee filter. I had one of these before. I used it so much and I had been looking for another one, everywhere. I could not find them. I was so excited to see it. I ordered one for myself and one for my daughter. It saves using paper filters and I just love it. Lightweight, easily cleaned, but the coffee grounds still have to be dumped. In the long run, tho, it saves on paper filters. The greatest thing about it is you won't have to worry about running out pf filters again.love it and so conveniet. My husband loves this product. Love my coffee filter &bought second . because it rinses easily or put in dishwasher. Paper filters are not expensive but I have to go buy them. It's getting colder in NE. I also bought one for my aunt. Little things make us happy. Where has this item been, all my coffee drinking life? I "absolutely" love it!!!!!!!!!!!!! This is wonderful...works gret and is easy to clean...and it saves me money !! These are great! Won''t go back to paper filter. Taste of coffee is really better. Wash used coffee out of filter refill and make my coffee. purchase and I would go for a third!! second set I have owned!! extract from basket, wash, and put back into basket!! Easy is that!! no mess at all!! I use the coffee filter with paper filters in case paper filter callapses and I dont get grounds in my coffee. Works as advertised. No more paper filters to buy. I have an older ice tea maker that uses the paper filters. Recently, I purchased a new coffee maker and discovered that they now have permanent filters. When I saw this filter I decided to order one for my iced tea maker. At first, I thought it wasn't going to fit but with a little work it did and I am now glad to be done with paper filters. WE USE PRE-GROUND COFFEE & FOUND THAT THIS REUSABLE FILTER DID NOT KEEP OUT THE FINER GROUNDS...IT WAS LIKE A LAYER OF FINE SAND ON THE BOTTOM OF EACH CUP. HOWEVER, WE PLACE A PAPER FILTER INTO THIS ITEM & IT PREVENTS THE PAPER FILTER FROM COLLAPSING & GROUNDS (LARGE & SMALL) FROM GETTING INTO THE COFFEE. LUCKILY, THIS ITEM DID NOT COST MUCH & WE FOUND A WAY TO USE IT THAT GIVES US GREAT COFFEE. The filter I received is not the one pictured. It is much smaller and unuseable in my standard size coffee maker. The filter I received is for a mini brewer or single cup coffee maker. The size of this filter was not very clearly written in the product description, otherwise I would have seen it. Regardless, what I received, and what is picture here are two different filters. Not happy with my purchase. Used one time. Too many coffee grounds ended up in pot. Coffee was very weak. This is definitely not for a 10 cup coffee maker. Description should have stated this is apparently for a very small coffee pot. Coffee is weak and gritty. Can't drink the last 1/4 of the cup due to gritty coffe grounds it lets through. This filter didn't work and made a complete mess out of making a pot of coffee. We threw it in the garbage. Tired of buying filters for my Ninja Coffee Bar. I use these for straining my goats milk. They are much easier to use than paper ones. I've used one like this for several years but added an additional coffee pot in a vacation spot so I got a 2nd coffee pot and had to have another one of these for there too!!! I needed them and can't find them in the stores. I have ordered these two for the coffee makers we use at church. I use one at home and love it. Because we needed new filters for the coffee pot. I'm going to try this with my coffee maker. It will save me money on refill filters. I hope. I needed a spiral filter for my coffee maker as the original one was thrown away. Getting tired of always buying coffee filters. I wish to stop having to keep buying filters for my Mr. Coffee Pot as I work shift work and always seem to be running out of filters when I want to make that pot of coffee before I have to leave for work. less expensive--greater taste--more convenient. Thanks! I'm a daily coffee drinker and I prefer saving as much money as I possible. tired of buying filters that often fold in and end up with grounds all over and plugging the coffee pot. Bought one for my daughter, and she liked it. can't find one any where with mesh bottom other one got a hole in it. My Gevalia coffee maker is tapered to its end, approx 1 3/4 inch; therefore it is not circular at the bottom. Both of your reusable coffee filters images look circular at the bottom. Am I seeing right and, therefore, I cannot buy one? BEST ANSWER: Thank you for your question. Unfortunately no it will not fit the coffee filters are too large. We hope this information will be of help to you. Does it fit in the top of a single cup? BEST ANSWER: Thank you for your question. No, this is for a 12 cup coffee maker. We hope this information will be of help to you. will this permanent filter fit a Mr. Coffee 5-cup programmable ? Cone: 3 7/8" dia. x 3 1/8" H. Basket: 4 1/2" dia. x 2 1/2" H.